Even with the new updates, I have a love-hate relationship with Bungie's MMOFPS Destiny, but one thing I've always admired is the game's visual flair. Destiny has always spun that critical illusion of sci-fi futurism, which is in no small way due to the game's impressive user interface. Now we get to see how the UI looked in the game's early stages, and it's quite amazing. At GDC 2016, Bungie's UI Design Lead David Candland gave a talk entitled Tenacious Design and The Interface of Destiny. In it Candland revealed how Destiny would have looked if Bungie followed their early prototypes--colorful, unique, eye-catching. Totally unlike the casual-friendly design we see today. Everything was different--character panes, inventory screens, reputation lists, the Director scheme, and vendors all had their stylish look. Hopefully Bungie will revert to their past styles at some point for Destiny. Maybe with Destiny 2 will get a neat visual overhaul. It's really interesting to see all the intersecting points and possible shapes the game could have taken, especially given how drab--yet clean--the current UI looks. 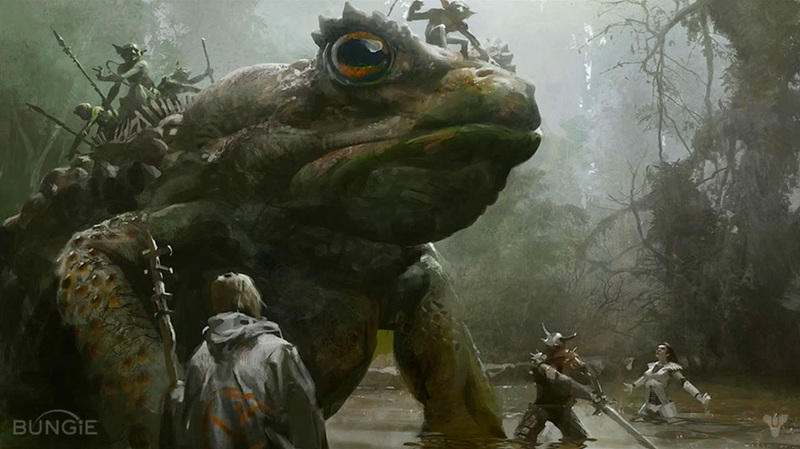 While we're on the subject of what could have been, when will Destiny get those awesome huge frogs as depicted in early concept art? Be sure to read the whole GDC speech for even more inference on Destiny's design--it's packed full of tasty tidbits that will sate your curiosity and give you a new respect for the game. That is, until, you fall back into the jaded grind.